Dave Worley, a digital take-up advisor at GDS, describes how we are helping services across government to encourage users to use the digital service. Point 14 of the Digital Service Standard requires services to encourage all of their users to use the digital service (with assisted digital support, if required), and to phase out non-digital alternatives. The digital take-up (DTU) team at GDS works with services to help them achieve this. There are a couple of parts to our work. There is indeed a channel shift element, and we help existing services to direct their users to the digital route by promoting the benefits. We also help digital government services to ensure they are adhering to point 14 of the Digital Service Standard. This includes helping them identify strengths and weaknesses in their DTU approaches. 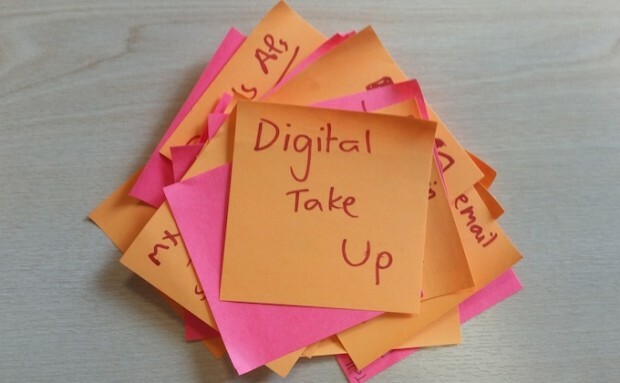 Good digital take up requires a service that is fully digital from the start (used either independently or with assisted digital support), and not a service supplemented with non-digital alternatives. We will be sharing our findings from across government. We will do this through our DTU blogs, the service manager community and by encouraging links between similar services. It’d be easy to say that our goal is 100% of all government transactions to be completed digitally. More realistically, we’re aiming at the Chancellor of the Exchequer’s 2014 Autumn Statement pledge of increasing digital take up by ten percentage points by the middle of 2016. This will take us above 90% of all transactions completed digitally. So far, we’ve seen successes such as the Carer’s Allowance service, which has seen a consistent rise in digital service use since October 2013. Another of government’s most used services, HM Revenue & Customs’ Pay As You Earn transactions service, sends over 95% of users through digital routes. There are challenges of course. We work closely with the assisted digital and digital inclusion teams at GDS to make sure government's efforts to maximise take up don’t exclude those who need our support. It’s also clear that introducing digital services to replace long-standing traditional ones will require departments to transform their approach to service delivery. By reducing resources spent on these areas, services can then focus on providing support for their users who need it the most. We’ll be publishing some examples of good practice and lessons learned by services across government over the next few weeks. You’ll be able to see them on the assisted digital blog. There are references here to phasing out non-digital services and replacing them with digital-only services. Many people will be unable to access these services. The alternatives must continue to be made available. If not, policies will simply not be put into practice in the way intended, leading to other unforeseen problems, as knock-on effects. Hi Sue - thank you for commenting. Government will always offer support to people who don't have access to the internet, to use digital public services. That support will be via non-digital routes, as required - for example over the phone or face to face. We call this ‘assisted digital support’, and you can read more about our work in this area on our blog. A very good informative read, but I'm concerned that the Digital Service Standard makes no mention of ensuring that digital services are accessible to those who use Assistive Software (AS) to access our services. The Standard does mention usability testing and making digital simple and easy to use, but nothing about testing for accessibilty. AS users have the technology to allow them to use digital services, without the need for assistance as long as those services are accessible. Hi Sue - thank you for commenting. Accessibility is one of our 7 design principles. In the service manual we state that, as a starting point, services should aim to meet Level AA of the Web Content Accessibility Guidelines (WCAG) 2.0; that services should be tested for technical accessibility by an accessibility expert and that services should be tested with disabled people, older people, and people who use assistive technologies. We also include a list of the assistive technologies that a service should be usable with.